EFEN GmbH has been supplying components and systems that make electricity distribution grids safer for more than 90 years now. The company is part of Hager Group and offers tailored solutions for applications in industry, infrastructure and the energy sector. And since the end of April 2017, customers now also have the option to order all components from the range around the clock in the new online store. The store is extremely easy to navigate, with products clearly divided into the following categories: “Fuse-Links”, “Power Distribution Components” and “Metering & Power Management”. Customers can simply select the products they want, then all the relevant technical data will be displayed on the screen. All it takes is a few clicks to select different versions. The new system also makes choosing the right accessories incredibly easy. The online store at www.EFEN-sales.com was officially opened at the industrial technology trade fair Hannover Messe at the end of April 2017. The new online store has a responsive design, so customers can also shop online completely hassle-free using mobile devices such as smartphones or tablets. EFEN GmbH, part of Hager Group since 2006, is a leading specialist in safety interfaces for power distribution systems that meet the IEC/DIN standard. The company’s systems distribute electrical energy, provide protection for people and assets, and ensure intelligent grid operations. Founded in Rheingau in 1922, the company now employs some 200 qualified workers in its two German plants. 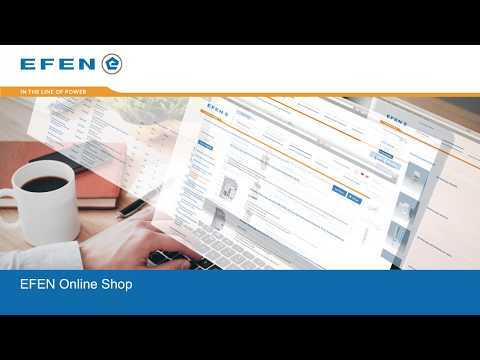 With subsidiaries in Hungary, Poland and the People’s Republic of China, as well as an international sales network, EFEN technology is available throughout the world.